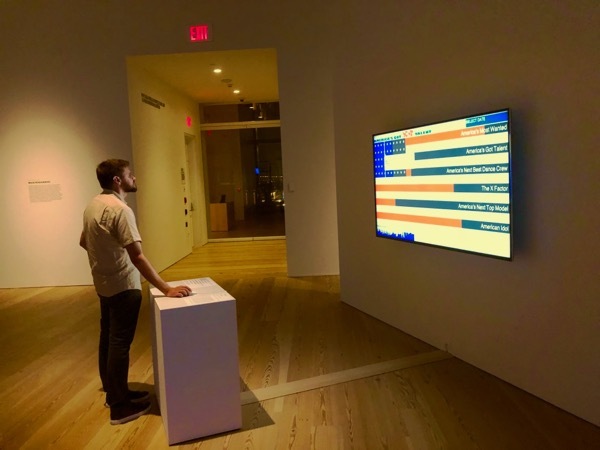 STATUS PLAY – 2004 | JONAH BRUCKER-COHEN, PH.D. STATUS PLAY – 2004 – JONAH BRUCKER-COHEN, PH.D. Adding sociability to the iChat status line. StatusPlay was an experiment in adding sociability into the seemingly limited display characteristics of the status line in Apple’s iChat instant messenger client. The StatusPlay suite of AppleScripts attempted to uncover how creating dynamic inputs into the status can affect relationships with other users of the chat client. 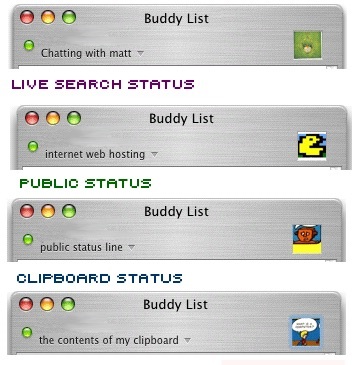 So far there are four distinct scripts/systems including ChatPerson: displaying the name of the person you are chatting with, LiveSearch Status: displaying live search terms from the Internet, Public Status: including an online form where people can input any text as your status, and ClipBoard Status: displaying the contents of the clipboard as the status. Building off of the functionality of the freeware application, iChatStatus, which consists of a Mac OSX System Preferences control panel to update the status line of iChat, StatusPlay is a series of AppleScripts that augment the status line into a more sociable display of user activity and input. Although iChat is compatible with AIM accounts, the status line is OSX specific, thus excluding PC users from viewing its content. Future work on StatusPlay will include more live input streams including audio, video, and other text inputs from location-based systems. I also plan to add a feedback mechanism for physical networked objects to update the status display output based on proximity. ChatPerson displayed the person you are currently chatting with in the status line by including their buddy name in the status such as “Chatting with mike” (see above screenshot). When you are not chatting with someone, the script will display the current song you are listening to in iTunes as the status. Live Search Status put live search terms that people searched for through search engines into the staus line (see above screenshot). This version requires a standalone application called “SearchString” that will parse and save the search string to a local file on your machine. This is included in the .zip file. Public Status allowed visitors to my website to input text that is updated as my status line. This allows the status line to be an open forum for opinions, ideas, announcements, and more, and ultimately gives up my personal control of what is said (see above screenshot). This version requires a standalone application called “Public Status” that will save the inputted text to a local file on your machine. This is included in the .zip file along with installation instructions. It also requires some basic unix knowledge to set up the input form on your website if you want to create your own input system. ClipBoard Status shows the contents of your clipboard as the status line. It is similar to my ClipIt! application that networks people’s clipboards together by giving people access to candid activity on other people’s machines (see above screenshot).